Nigerian singer, David Adeleke, popularly known as Davido, hit song "IF" has topped the MTV Base Round-table hottest Naija tracks chart and has been selected as the hottest song of 2017. 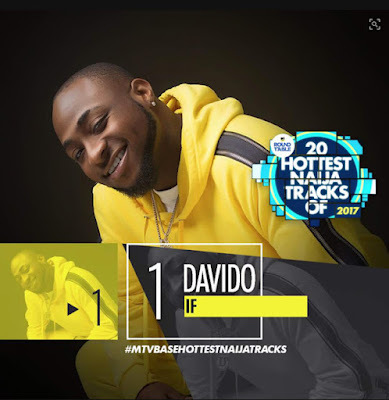 Boasting of over 54 million views on youtube, “If” was produced by Tekno. The song spurred trends and memes on social media because of Davido’s jaw dropping claim of having “30 billion in his account”. After careful consideration and debate by the panelists, it was considered the song with the most buzz, impact and longevity. Coming right behind Davido’s “If” at Number 2 and 3 are Small Doctor’s “Penalty” and Runtown’s “Mad Over You” respectively. On the panel that decided the MTV Base Roundtable hottest Naija top 20 tracks for the year 2017 were: MTV Base VJ, Ehiz Okoeguale, Universal Music Group Nigeria GM, Ezegozie Eze; Social Media Critic and influencer, Tosin Adeda; Nigerian DJ, Obi Ajuonuma; Digital Media Manager, MTV Base, Adetola Adekoya, Cool FM on-air personality/ Rapper, N6; Online Entertainment Editor, Pulse Nigeria, Joey Akan; and Beat FM On-air personalities- Gbemi Olateru Olagbegi and Dami Elebe. The criteria for inclusion in this year’s selection was based on the songs been released no earlier than November 2016, and was weighed according to a range of criteria – from impact in the media, to level of buzz and longevity. Other amazing songs that made the honorable mentions list but didn’t make it to the top 20 include; Falz- “Wehdone Sir”, Wizkid- “Daddy Yo”, Reminisce - “Ponmile”, Seyi Shay- “Yolo Yolo”, and B-Red FT. Davido- “Fall On You” .